We had arrived in Rome a few hours earlier from Tuscany via Ceri. We agreed we wanted a light dinner – preferably fish. The hotel concierge recommended the 4 Mori around the corner from the hotel. The restaurant has been in business since the early 50s and has a reputation for high quality food. There’s an anecdote about the restaurant. Pope John XXIII, the little maverick Pope with a twinkling smile who was responsible for Vatican II, which reformed the church, would leave the Vatican without his escorts and would wander about. One day he wandered into the 4 Mori restaurant. The restaurant soon became famous as Cardinals and other Popes have gone there. We were both craving for fish, which was absent from our diet for the most part of our 10 weeks in Tuscany/Umbria. The restaurant was nearby. It was a hot evening, our first in Rome after leaving the villa, but the temperature inside the restaurant was comfortable and the décor pleasant and the waiters amusing. As we waited for our menus, the waiter, Gianni, came by to ask if we wanted fish or meat. In unison, we said “fish.” Moments later, water and wine appeared on the table. We said we just wanted a glass, but Gianni opened the bottle and said “Drink what you want!” Again, we waited for the menus, but none came. Instead, a waiter, a Bangladeshi, brought out six plates, each with fish on it and each different and each delicious. Wow, we thought, this is just what we wanted! They were small portions and each appealed to our need for a light meal. One was octopus, another sliced calamari. The six plates were removed. 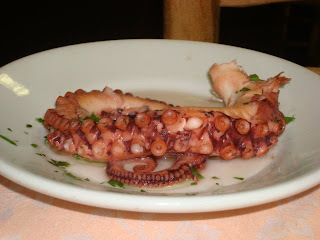 Two more fish dishes appeared which included miniature octopi, about an inch long, again delicious. They were crisp and we’ve never experienced them before. We thought that this was certainly the end of our evening dinner, but no. Out came a risotto cooked in a scampi sauce with a touch of tomato to give it a pink color. It was to die for. Wow! We thought it was over; we were now getting beyond the vision of a light meal. But not the case: out came a plate of penne pasta also with a scampi sauce, perhaps the same sauce used for the risotto. It was great and we figured that this was now the end of the meal. We even suggested to Gianni that we could not possibly eat any more. He smiled. Shortly after removing the empty plates, out came two sorbets to cleanse our palates; we thought these were the desserts. Wrong again, out came a large platter consisting of prawns, calamari and other fish. Our efforts to stop the endless parade of dishes went unheeded. Another white fish appeared. We ate that too. Wow! It was finally over. What a fantastic “Light” meal! This was the plate with a variety of seafood. After our plates disappeared the Bangladeshi brought out a huge bowl of fresh fruit and, oh no, a tiramisu dessert. Finally, it’s over. Wrong again. Out came 3 bottles of booze, two grappas and one limoncello. 6 small plates of varied fish, including a large piece of octopus, some squid, sardines in an oil sauce and 3 others that we ate and had no idea what they were, but were tasty. What a fantastic re-introduction to Rome. We wondered what this evening would cost; we imagined well over 100 euros, but were surprised when it came to 90 euros. Fabulous. It was the best LIGHT meal we’ve had in a long time. We began dinner at 8 and left the restaurant at 1030, waddling our way back to the hotel and commenting, as we walked, that "we’ll have a light meal tomorrow." If you’re ever in Rome and want a spectacularly great light meal, we urge you to go to the Quattro Mori located Via S. Maria alle Fornaci 8, and ask for Gianni. We established a good relationship with him; he has a crazy sense of humor with unusual eye and facial movements. We urge you also to starve yourself all day before going there. You’ll not be disappointed with the quality of food and great atmosphere. The discovery of this villa online was a stroke of considerable luck. Once the decision was made that we would spend a holiday in Tuscany, we began to search the web, landing on VRBO.com (Vacation Rentals By Owner). 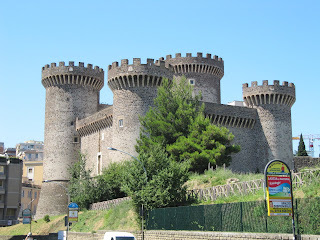 Our first choice was Tuscany but we searched for villas in Piedmonte, Le Marche, Umbria and even into Lazio. One of the choices included a villa near Tivoli, but there was limited availability. We arbitrarily decided on a minimum of 10 weeks, believing that to truly see Tuscany/Umbria, to learn the language and food, we needed time to explore and to truly get to know the customs and people of this region. We focused on several properties and communicated with the owners. We eventually chose this villa based on the rooms available (7) a large swimming pool and an enclosed area, which was important to protect the little ones. We discussed our plans with the children and all agreed that they would visit. We signed the contract in October. The villa has 7 bedrooms, two balconies, one off of the main bedroom and another off of the principal living room, a large dining room and kitchen. We wanted a suburban setting, yet close to towns and we also wanted quietness and a place with a vista. Well, we found the right place: Vacanze Ferraguzzo. The property is completely enclosed and has a grassy area that covers about ½ acre. The pool is 21 by 66 feet. The property owners, Lido, Osanna and their son, Luca, meticulously maintain the property and have been extraordinarily responsive to our minor needs and numerous questions about the areas. The villa has six bikes for use, a bocce court, slides for the kids and a children’s area with kid-size tables and chairs. Because of Linda’s gardening interests, Lido tilled a small area for us to plant some herbs – basil and rucula. The villa has all the amenities and then some. The rooms and beds are comfortable; it is kept clean and neat at all times, with a cleaning crew arriving at 9 every Saturday to change the sheets and towels and thoroughly cleaning the entire villa. We have played bocce and guests have used the bikes, but the treat is the pool with lots of space and beach chairs and umbrellas. There is a laundry area with a washing machine, but no dryer. The owners have provided a number of drying racks for that purpose. Growing up, it was customary on Sunday to have lunch (pranzo) outside. The loggia at the villa allowed us to replicate what Al remembers as a child. In May and early June, we brought our dirty clothes into a laundry service in San Sepolcro, because the weather was cold and rainy, but since then, we’ve used the drying racks provided here at the villa. The clothes dry quickly in the Tuscan (Umbrian) sun. By the way, Mario’s laundry service on the main road in San Sepolcro charges 15 Euros for a bundle of clothes to wash, so wait till you have a bundle, if you plan to wash lots of clothes. The villa is convenient to a small market, in the town of Fighille (we call it Fig Hill, but it’s pronounced Fee –gee -lee); in fact, it’s within walking distance – about one mile each way – where you can find most anything in the food line – some of the best cold cuts – you must try the Finochiona salami, it has fennel in it and delicious. There is wine, beer, sodas, chips and other tantalizing foods, but you can also buy hard liquor as well. They sell fresh pasta every day. Each of the girls working there is very pleasant, as is the gentleman whom you will also see. One of the girls does speak some English. For other shopping, there are several major grocery stores, all of which are in San Sepolcro – Coop, Tem and Famila (not familgia). From the villa, it’s about 9 kilometers. It’s more like our supermarkets in the States in that they sell everything including clothes. Unless you need something very special to use, wear or eat, you will find most everything you need in these markets. You can buy most drugs at the pharmacy, often without a prescription. The owners have been extraordinary helpful with their vast knowledge of the area, where to eat and what to do. One of them is usually on the grounds of the villa every day to ensure that all is functioning properly, but also to ensure the neatness and cleanliness of the area. They are unobtrusive and will come to your rescue only when you need them. The villa is run as a business, very much like a hotel, so that the owners must maintain certain standards imposed by local and state governments. They will ask for your passports on arrival – and also those of your guests, much like most hotels do. That's Lido on my right and Luca kneeling. As you can see from their work clothes, they are always working to keep the villa, safe, clean and comfortable. They are special people and we know that one day soon, we'll return for another vacation. Luca always working. His weekly chore - cutting the grass. Much has been written about Tuscany, including books by Frances Mayes “Under the Tuscan Sun” and her newest, “Everyday Tuscany,” so we had a good grasp of the area before arriving, but while the books and other literature gave us a start, nothing exhilarated us more than to witness firsthand the extraordinary beauty and quality of life in this area. While technically in Umbria, we are less than 500 meters from the Tuscan border and most of the towns and cities we’ve visited are in Tuscany, although occasionally visiting an Umbrian city (Perugia and Spello) and also into Marche to visit Urbino. Before leaving the U.S. we researched every town and city within the Arezzo region (Arezzo is the titular capital of western Tuscany and has 39 comunes (townships)), subsequently preparing a list of the towns and cities we wanted to visit based on a simple criterion – what’s there that we should see given the time available? As we were using the villa as a base, each outing had to be completed in one day and we tried to limit our travels of less than 80 kilometers (50 miles). We had several goals before we began our trip: learn the language, learn about the history of this area, learn the customs and, of course, learn more about the regional cooking and also taking a cooking class. In doing so, we explored the history, art and beauty of cittadellas and paesi mediovales (medieval cities) and the many museums we would come across on our visits. We began language studies with a brilliant Italian scholar who taught Latin for 15 years and has a Doctorate in Etymology. Eugenio, whom we meet twice a week for an hour each time, has been extraordinarily patient with us as we both stumble through the language. Our minds have been dominated by Spanish, or in the case of Linda, Spanish and Portuguese, but we’ve progressed and are able to carry on intelligent conversations with locals, store keepers and others. Eugenio lives in Anghiari and works as a cook/waiter at the Gran Duca restaurant in Anghiari, which we highly recommend. It may be useful to know that we have eaten in numerous restaurants, some we’ve revisited on various occasions, but each was very good. We never had a bad meal. You should try the Osteria in Citerna (Sylvia is a sweetheart), La Nena (Mario, Paulo and Erica) and Algheiri Sylvia and Gianni) in Anghiari, but there are several in San Sepolcro that are also very good: Osteria del Poeta, Da Ventura and Fiorentino. You must try the pizza at Balducci’s on the piazza in Anghiari. It’s excellent. Finally, you must visit Citerna. We walked to Citerna twice a week and, at the end on our arrival, the peace de resistance is our cup of cappuccino and a pastry at the Bar, where Fabio and/or Patricia will serve you with a smile. There is nothing more delightful then to sit outside in their patio with a view of the valley and converse with the local residents. This was one of the many highlights of this trip. Then, if you to buy something in the food line, the deli is right next door and Marisa will pleasantly serve you. She is another of the sweethearts of our trip, always smiling and joking. She lives above the Bar and if you need something at the last moment and the stores are closed, Marisa will tend to your requests. This villa has been home to us for the 10 weeks; we did not try to stay overnight at any location. We find it very comfortable and do not look forward to our departure. It is quiet, serene and beautiful. This visit has fulfilled our dream of enjoying a long vacation in one area of Italy. We will return to this area – and, if available, at Vacanze Ferraguzzo. You will not be disappointed. A touching final episode - and an emotional one. After our final abracchi, I found this note on the door leading to the parking garages. It says: Alberto and Linda, Our friends, You are Marvelous people, thank you for everything. With our dear friends, Jim and Yvonne, we traveled to Urbino, which is located in Le Marche (pron: Lay Mark-ay), a drive which was supposed to be about 79 kilometers, according to the GPS, came out to be 97 kilometers traveled over a twisting and winding road climbing to an altitude exceeding 3,000 feet, before descending into the valley on the other side of the Apennines mountain. We passed the towns of Bocca Trabaria, Borgo Pace and Mercatello before arriving in Urbino. The vistas from on high were fabulous, at least for those who did not fear looking down into the valley we just left. The weather was perfect – sunny and in the 80s. The recorded history of Urbino dates back to the 3rd Century B.C. As a part of the Papal State, Urbino was in a strategic location during the many battles fought by the church against those challenging their rule. In 1155, Antonio da Montefeltro settled a conflict with Barbarossa in Rome and was awarded the title of Count and Imperial Vicar of Urbino. As the centuries passed, the Montefeltro dynasty gained political prestige and cultivated contacts within the art world. In 1416, the brothers Lorenzo and Jacopo Salimbeni were hired to paint frescoes on the walls of the Oratory of San Giovanni church where they created an excellent representation of Gothic art. Other artists followed. An interesting sidebar: the death in 1443 of Guidantonio, the reigning leader at the time and a fervent supporter of the arts, caused the control of Urbino to be passed to his 16 year old son, Oddantoni , who was incapable of fulfilling the role his father had performed with wide support from the populace. The result was that an angry crowd pursued him and threw him out the palace window (finestration) along with two of his ministers. 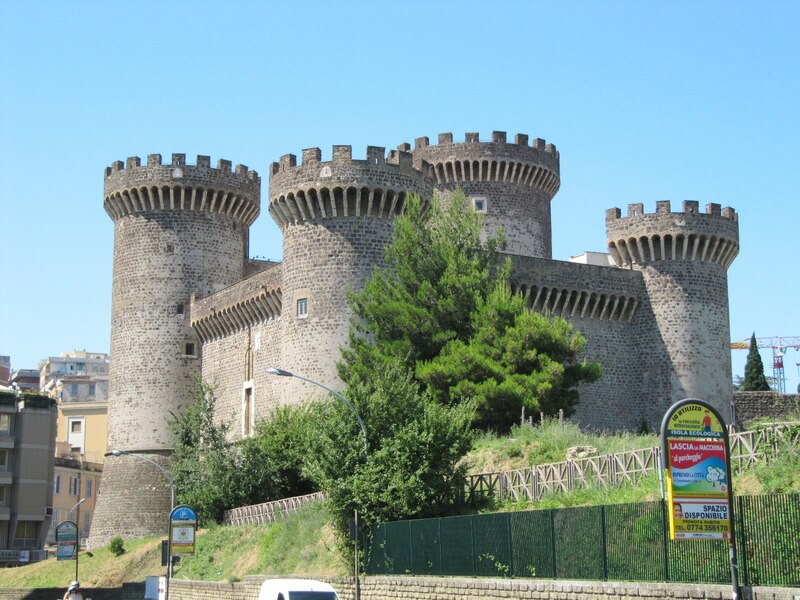 The illegitimate son of Guidantonio, Federico, who was born in Gubbio, was summoned to Urbino to appease the people. Federico had a reputation of being wise. Unlike what was expected, he did not organize a vendetta against those who eliminated his half brother, but began building the foundations of a new reign, which resulted in the beginning of a great period for the Court and the people. Through the marriage to Battista Sforza, a marriage that only lasted 12 and a half years, but during the period, Urbino had gone through a significant transformation. The Court became a center point for Renaissance culture, mathematicians, legal experts, architects and painters. Piero della Francesca, a native of nearby San Sepolcro was just one of the important painters that found his way to Urbino. In fact, della Francesca’s Flagellation, which was hung in the Duomo, was moved to the Ducal Palace. Door of War with inlaid wood carvings by Barocci. The Ducal Palace is the centerpiece in Urbino and was planned with considerable care over an uneven land. The photos will show some of it beauty. The core of this Palace is the interior with gorgeous doors made of inlaid wood with intricate designs created by some of the famed artists. One door, the Porta della Guerra (Door of War), was the work of Ambrogio Barocci who was very active in the second half of the 1400s. Regrettably, photos were not allowed, but some were secretly taken (maintaining some skills) and are included. Madonna Enthroned Among Angels by Girolamo de Giovanni. The blond youth portrays the son of Federico Buonconte, who died very young of the plague. The person on his left is purportedly Cardinal Bessarione who tried to influence the Duke to join the crusade against the Turks. Valbana Gate opens onto the square. It's reported to be the most important gate of the city because it leads to the main street - via Mazzini and because of its scenographic architecture. For those traveling to Venice from the south should detour to see Urbino. We can only describe the beauty, but to witness it firsthand is precious leaving with you a memory of the skill, ability and creativity of the painters and sculptors of the 15 and 16th centuries.